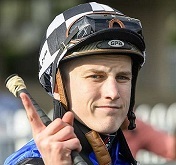 It seems a matter of time before top Kiwi apprentice Sam Weatherley breaks through at stakes level in Australia and he’s quietly confident that could happen at Randwick on Saturday. Sam Weatherley is eyeing his first Australian stakes win at Randwick on Saturday. (Pic: Bradley Photos). The 19-year-old continues his successful association with Mandylion in the Group 3 $160,000 Harrolds Angst Stakes (1600m) and has picked up the ride on promising colt Purple Sector in the Group 1 $500,000 Moet & Chandon Spring Champion Stakes (2000m). Since arriving in Sydney back in late June, Weatherly has only had a few chances at Group level but is already a Group 1 winning rider in New Zealand. “The two rides I have are the best in stakes company I’ve had since I came over,’’ he said. On a good track, Weatherley concedes the Gwenda Markwell trained Mandylion would be considered an outsider but with an unbeaten heavy track record he warned not to undersell her. The mare was an all the way winner over 1500m on a heavy track at Rosehill on September 8 then two weeks later fought on for third behind Tip Top on good ground. “Because she will like the wet ground she is quite a nice ride,’’ Weatherley said. “It is a step up for her going into that grade but she has no weight on her back and I think if we can jump and get a nice lead, like we have been, on that wet ground she can sprint and open them up. “She was very brave last start, she probably went a little bit hard, she wasn’t as tractable as she was before. Mandylion is an $8.50 chance with TAB in the Angst, won for the past two years by Dixie Blossoms who will attempt to make it three straight on Saturday. Weatherley is quite excited by the chance to ride the John Thompson-trained Purple Sector in the Spring Champion and hopes he handles the conditions after a luckless third in last week’s Dulcify Quality (1600m) behind Mickey Blue Eyes and Gem Song. “He was real good wasn’t he. He was unlucky,’’ he said. Punters Intel data shows Purple Sector ran 33.95 for his last 600m in the Dulcify, and 11.20 for his last 200m, after being badly held up until passing the 100m mark. A little bit of family knowledge about Purple Sector tells Weatherley the three-year-old, $9.50 with TAB, might not have an issue with a rain affected track. “I’m not too sure about wet ground but I know the family quite well,’’ he said. “Dad broke in three or four horses out of the mare at Trelawney Stud and they all seem to go on soft going.